The 2012 golf season is now underway and we have our first winners, with Shrivenham Park taking the Junior Champion Club Title at North Oxford during the Easter Holidays. They now go on to represent the County Union at Woodhall Spa in August and we wish them the best of luck and hope they can return as England Junior Champion Club. We have started a Futures Tour, kindly sponsored by Nike, that incorporates 9 events for those in the age categories of Under 12 and Under 14. There is also an Order of Merit running within each Age Group. We have had 2 events so far at Caversham Heath and at Temple. Nick Elmey (Drayton Park) and James Duffy (Castle Royle) took the Under 12s Scratch prizes at the respective venues and Michael East (Burnham Beeches) and Zac Cooper (Beaconsfield) were the Under 14s winners. We have had a couple of friendly matches which have given our new County Captain, George Wilson, a good insight into his probable 1st Team. Again, our thanks to Nike for providing kit for the Squad Members and to Fullers for their financial support. We are looking forward to a successful season at all levels and hope that the effort put into winter coaching will pay dividends this year and that we get to at least one National Final. Our Golf Partnership continues to thrive and my thanks to all those involved for their unbelievable commitment to ensuring that we introduce as many people to our great game and encourage players to take up club membership. The County Card scheme continues to prosper and we now have over 1,250 Clubs participating all over England. We are pleased to announce that the scheme now encompass most of England with just a few fringe Counties not willing to join in. We are still trying to persuade them otherwise. At just £15 for 2012 it represents a real bargain and most participating clubs welcome Card Holders at the Members’ introduced green fee rate. All the money from this scheme is channelled into the Golf Partnership. Details are available from your Club Secretary or from our website. We have played a number of Friendly warm up matches against our stronger Clubs with the Captain, George Wilson (Calcot Park), trying out a few new players as we have lost some regulars to the professional ranks. Once again, diary clashes will prevent us from fielding our first pick players on all occasions, but it is something we are working on with the English Golf Union to mitigate as many of these as possible. Team at Calcot Park: Steve Barwick (Stoke Park), James Foster (Newbury & Crookham), Jack Haines (Gerrards Cross), David Langley (Castle Royle), Joe Richardson (Frilford Heath), Ben Smith (Bearwood Lakes), Josh Stanners (Hazlemere), Ashley Walton (Frilford Heath). Team at Frilford Heath: Harry Chapple (Calcot Park), Andrew Lynch (Stoke Park), Matt Johnson (Chipping Norton), Ross Mitchell (East Berkshire), Josh Stanners (Hazlemere), Ollie Tite (Witney Lakes), Ashley Watkins (East Berkshire), George Wilson (Calcot Park). A new fixture for this year was a match against the BB&O Pros. We usually play Warwickshire in a pre season friendly, but they were unable to offer us a date this year. Instead we took the Pros on at Heythrop Park on 24th March and were outplayed in the morning foursomes and trailed 1½-3½ at lunch. A much better performance in the afternoon as we shared the spoils but eventually lost the match 6½-8½. We look forward to a return match next year. Team at Heythrop Park: Steve Barwick (Stoke Park), James Foster (Newbury & Crookham), David Langley (Castle Royle), Steve Jensen (Woburn), Matt Johnson (Chipping Norton), Andrew Lynch (Stoke Park), Dean Newbold (Frilford Heath), Ross Mitchell (East Berkshire), Malcolm Reid (Sonning), Ollie Tite (Witney Lakes). Team at Caversham Heath: James Foster (Newbury & Crookham), Matt Johnson (Chipping Norton), Andrew Lynch (Stoke Park), Dean Newbold (Frilford Heath), Malcolm Reid (Sonning), Joe Richardson (Frilford Heath), Josh Stanners (Hazlemere), Ollie Tite (Witney Lakes), Ashley Walton (Frilford Heath), Ashley Watkins (East Berkshire). This season-opener for the Squad was played on a sunny but breezy afternoon on Wellington College’s demanding home course on 3rd March. This was the first time the Squad had come together this season, so it was a good chance to see the results of some of the winter training. David Langley started his tenure as Captain with a superb performance against England Ladies International Alex Peters and with birdies being swapped at almost every hole, the result was a very fair half. With a 3 under gross score this bodes well for David's season. George Bell and our own Will Cooper (playing for Wellington) had another titanic tussle with Will holing a 15 footer on the last for birdie to take the match by a single hole. Congratulations to Harry Collins, who, on his debut for BB&O, notched up his first victory over the talented Cameron Farmer. Tim Shin carried on from his U16 performance with a great win over Surrey player Charlie Coleman and Jordan Williams was too strong for Sam Williams (no relation). Newly crowned with the Boddington Trophy, Max Nicholls stepped up to the Elite Squad with a valuable half and looks to be a great prospect. Jake Dines and Alistair Cameron both took it to the 17th before succumbing but will be ready next time to close things out when they get the chance! The overall result was 4-4 and we look forward to the return match at East Berks in October. Team at Wellington College: George Bell (Harewood Downs), Alistair Cameron (Beaconsfield), Harry Collins, (Frilford Heath), Jake Dines (Hinksey Heights), David Langley (Castle Royle), Max Nicholls (Newbury Racecourse), Tim Shin (Castle Royle), Jordan Williams (Frilford Heath). 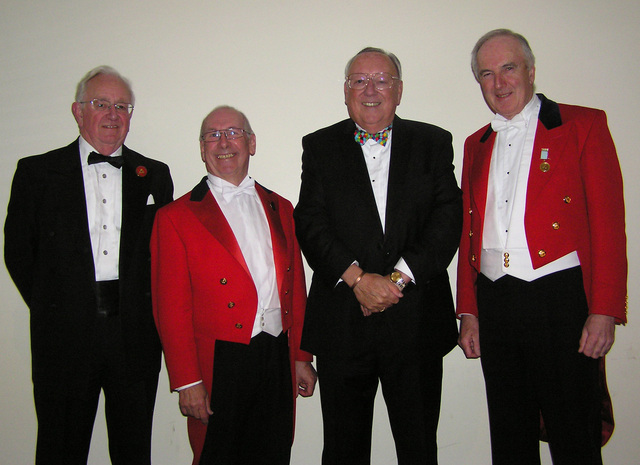 Our next port of call was to Hampshire to play them at Meon Valley on 1st April. The team were excited to play at this venue and keen to avenge the defeat by Hampshire in last year’s fixture. We started well in the morning on the 9 hole Valley Course and led 3-2 at lunch. Particularly good performances came from two of the younger squad members Max Nicholls and Chris Little who had a fine 3 and 2 victory. Also playing well were Alistair Cameron and Jake Dines who had an impressive 4 and 3 win over their opponents. However, the afternoon was a different story. Playing on the main Meon course where 60% of the tee shots were blind, the Hampshire lads used their local knowledge to good effect. Meon Valley is the Hampshire training centre and also the home course for a number of boys. From our top four, only George Bell could muster a win and he was joined by Max Nicholls and Ben Beach further down the order. They all won on the 17th or 18th holes whereas some of the BB&O team were beaten with several holes to go. Once again we rather lost our concentration coming into the final few holes and we'll be working on this in the coming weeks. The Hampshire team were deserved winners 9-6 and we look forward to a rematch later this season in the 6 Man Team event. Team at Meon Valley: Ben Beach (Stoke Park), George Bell (Harewood Downs), Alistair Cameron (Beaconsfield), Will Cooper (Woburn), Jake Dines (Hinksey Heights), David Langley (Castle Royle), Chris Little (Frilford Heath), Max Nicholls (Newbury Racecourse), Harry Wetton (Woburn), Jordan Williams (Frilford Heath). We then travelled to Aldwickbury Park on 12th April. Following a great two days coaching session at Cumberwell Park, the team had a few days to groove their swings and work on their mental preparation. With two of the top order being rested, and a couple of other injuries, beating Hertfordshire on their home ground would be an uphill task. It's been a while since we beat them at this age level as they are always able to field a strong side. But the team responded magnificently! At lunch the honours were even after the foursomes - so it was all about individual performances in the singles. The course was in pretty fair condition and despite the odd hail shower the BB&O lads kept their focus and concentration really well. The top 5 were unbeaten with outstanding performances. George Bell took maximum points on the day playing at number one and captaining the side. He had a terrific match with Hertfordshire’s Sam Towler, played in a great spirit and managed a superb sandy par at the last to win his match. Jordan Williams, Ben Beach and Harry Collins all won and Tim Shin finished all square. Well done also to the two U16 players - Chris Little and Max Nicholls who remained unbeaten all day with both winning their singles comfortably. The end result was a 9-6 win for BB&O. This was a terrific performance by the team and one that shows how good we can be when we apply ourselves. Particular thanks should go to the coaches who have helped to contribute to the team's improving form. Team at Aldwickbury Park: Ben Beach (Stoke Park), George Bell (Harewood Downs), Alistair Cameron (Beaconsfield), Harry Collins (Frilford Heath), Jake Dines (Hinksey Heights), Chris Little (Frilford Heath), Max Nicholls (Newbury Racecourse), Tim Shin (Castle Royle), Harry Wetton (Woburn), Jordan Williams (Frilford Heath). 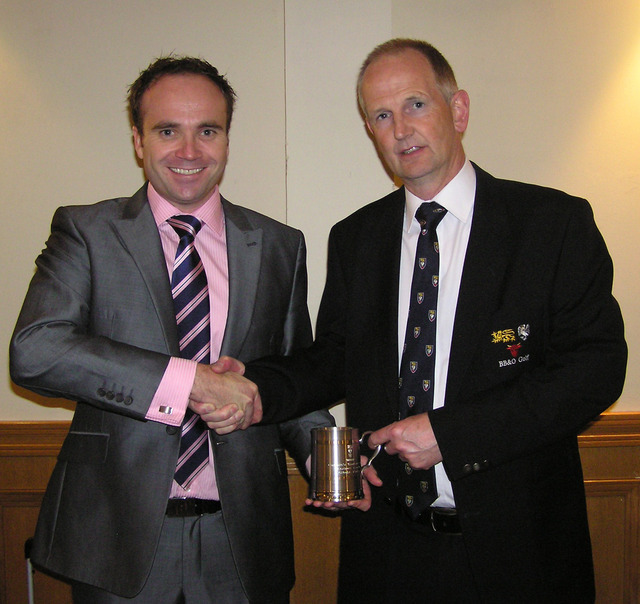 Burhill Golf Club was a terrific venue for this annual match and the Surrey team were most hospitable on 21st April. The weather threatened to be squally but in reality it was not a factor in this very close match. After the morning foursomes the BB&O team had a slim lead with excellent results from David Langley and Jordan Williams at the front. The pairing of Ben Beach and Jake Dines also had a strong win and the well established partnership of Chris Little and Max Nicholls did their stuff as usual. The afternoon singles were a very mixed affair with some incredibly tight matches and some very big wins on either side. David Langley, playing at Number 1 showed no signs of fatigue after his excellent results in the recent 72 hole McEvoy Trophy and he despatched his man comfortably - having always been in control of his match. Unusually both Ben Beach and Jordan Williams suffered heavy defeats but George Bell and Tim Shin romped to equally large victories. So having won three of the top five we were hopeful of back-to-back wins against Surrey. Sadly, of the remaining five players, only Max Nicholls was able to win his match whilst Harry Collins fought hard for a half leaving the match tied overall seven and a half points apiece. Max Nicholls and Harry Collins have so far retained their unbeaten record in singles match play this season - a superb performance from them both. Well done also to David Evans who joined the Elite Squad for his first match and put in a very disciplined and solid performance. David has 3 more seasons with the Elite Squad and along with the other younger members will undoubtedly have a very successful County career. The team will have a month to work on their game now before playing Bedfordshire on June 2nd and the Six Man Team a few days later. Team at Burhill: Ben Beach (Stoke Park), George Bell (Harewood Downs), Harry Collins (Frilford Heath), Jake Dines (Hinksey Heights), David Evans (Woburn), David Langley (Castle Royle), Chris Little (Frilford Heath), Max Nicholls (Newbury Racecourse), Tim Shin (Castle Royle), Jordan Williams (Frilford Heath). Team at Farnham Park: Angus Bolton (Burnham Beeches), Charlie Brown (Castle Royle), Matthew Cradock (Witney Lakes), Nick Elmey (Drayton Park), John Gough (Stoke Park), Alex Hayes (Hazlemere), Seb Jones (Castle Royle), Thomas Kane (Woburn), Callum Kirby (Harleyford), Ryanpal Ubha (Beaconsfield). 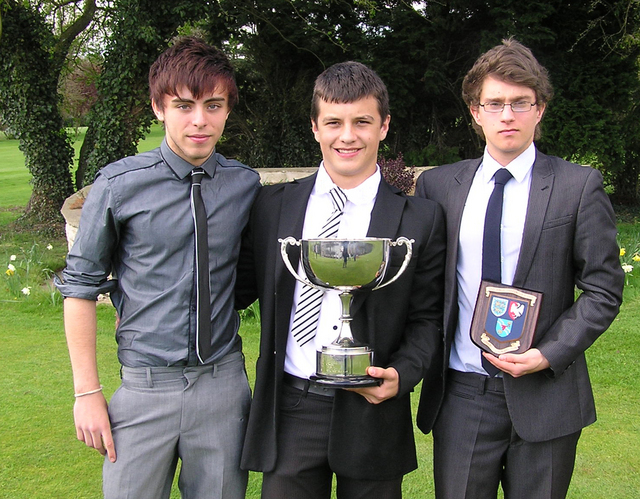 The BB & O Junior Champion Club was played at North Oxford Golf Club on Monday 11th April. The format is the best two medal net scores from three counting. Players are restricted to 20 for Boys and 28 handicap for Girls. The leading Club goes on to represent BB&O in the English Junior Champion Club Tournament being held this year at Woodhall Spa on 25th/26th August. It was a very close contest for most of the day as the lead changed hands several times as each team posted 2 counting scores. However as usual, one great score can turn the whole tournament on its head and this year was no exception. Callum Jeffries from Shrivenham Park was this year’s ‘player of the day’ as he scored a remarkable 71 gross off 12 handicap. His net 59 added to Sam Plumb’s net 66 gave them a winning margin of 8 shots from the Frilford Heath Team. All the players were a credit to their respective Clubs and the event was played in great spirit and everyone wished Shrivenham Park the best of luck in their attempt to become English Junior Champion Club in August. The 50th Annual Dinner of the County Union was held at the Blue Mountain Golf Centre on Monday 5th March Some 210 people had an excellent evening listening to our three Guest Speakers. Paul Baxter, President of England Golf and Alistair Low, Captain of the R&A were the Principle Guests and Bob ‘The Cat’ Bevan was our final - and very amusing - speaker. Max Nicholls (Newbury Racecourse) won the Boddington Trophy in 2011. This award, given by the Honourable Company of Oxfordshire Golfers is for the most improved Junior in BB&O. 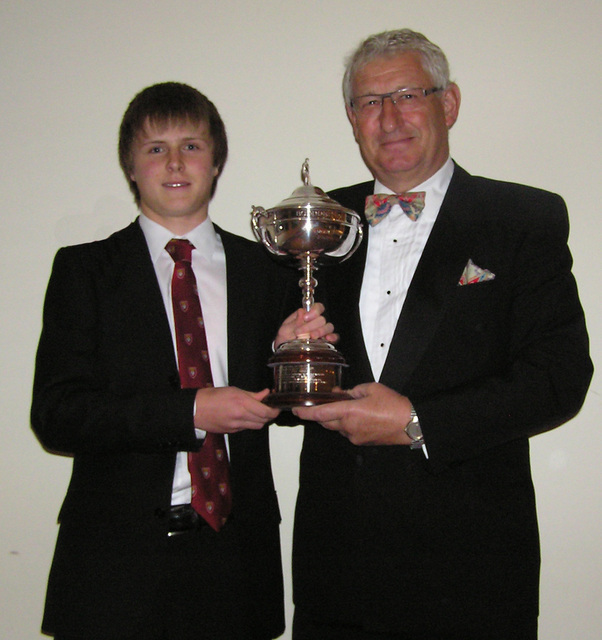 Andrew Lynch (Stoke Park) was the Captain’s choice to receive the Player of the Year award and Sandy Bolton (Frilford Heath) won the Order of Merit Trophy. In accordance with the Notice sent to all affiliated clubs in November 2011 – David Westlake (Maidenhead) was unanimously elected to the Executive Committee. Duncan Forbes (Sonning) was elected as President-Elect and will take office in 2013. Peter Phillips (Henley) was appointed a Life Vice President for his work in the late 1990s and early 2000s with the Junior teams. Charles Tennant (Reading) was similarly honoured for his 8 years of work as the Championship Chairman. Most of the 'Any Other Business' focused on the effect of the current water shortage on Golf Clubs. 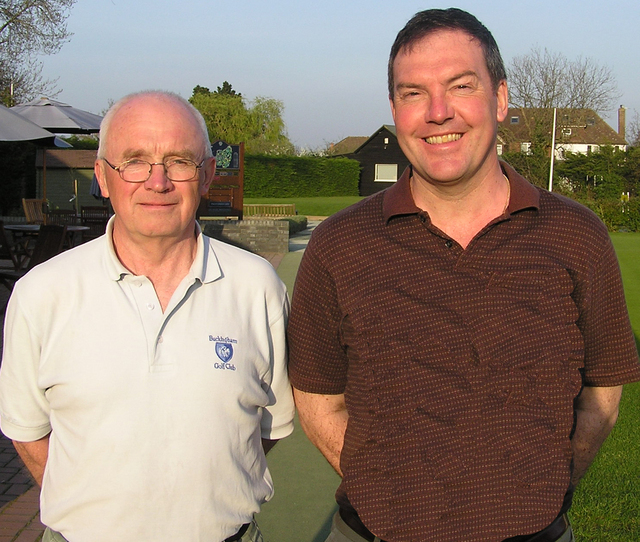 Finally, on a glorious Spring afternoon the first 'Major' of the year took place with Peter Frost and Chris Wilkes of Buckingham edging out the Executive Committee duo of Mike Partridge and David Cowap to claim the spoils.